Here are some lapbooks that celebrate the meaning of Christmas. Download them for free and use what you want to make your own Christmas Lapbook. Birth of Jesus- word wall, Bible story with questions, songs and/or finger plays, activities, crafts, games, coloring, handwriting, mini books, puzzles, etc. Birth of Jesus- vocabulary words, Bible story with questions, activities, crafts, games, puzzles, mazes, mini books, worksheets, etc. Wise Men- vocabulary words, Bible story with questions, activities, crafts, games, puzzles, mazes, mini book, worksheets, etc. 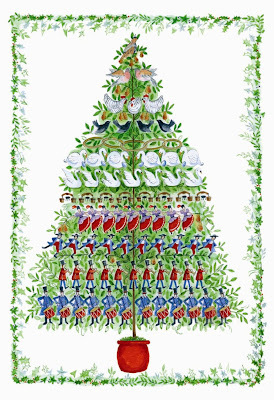 christianpreschoolprintables.com- Christmas Word Wall (scroll down to this). Word wall templates are large flash card printables that you can hang on the wall to aid children when they are learning or using new vocabulary words. dltk-bible.com- Christmas Word Wall Word Templates (scroll down to bottom for this). Word wall templates are large flash card printables that you can hang on the wall to aid children when they are learning or using new vocabulary words. Use the cards you want that are posted. Read story: “A Baby In A Basket” (Snip and Tell Bible Stories by Karyn Henley, page 22 & 24) and do cut outs as the story unfolds. Or you can use your own Bible story book. Introduce songs and/or finger plays: What town was Jesus born in? Five Happy Shepherds (finger play)- Pray & Play Bible for Young Children by Group Publishing, page 101. Going To Bethlehem, Christmas Is Jesus’ Birthday, Jesus Is Our Gift (songs)- Pray & Play Bible 2 by Group Publishing, page 111. Introduce activities: Where was it that there was no room? dltk-bible.com- The Christmas Story lesson with memory verse, teacher's guide, puzzles, take home sheet, coloring pages, crafts, etc. Introduce craft: Where was Jesus born? In a stable. Directions: Print out Christmas Nativity and stable background for students. Have students color Mary, Joseph, baby Jesus, and the lamb and cut out. Glue characters on stable background. Introduce crafts: How did the Wise Men find Jesus? An easy and pretty star craft made out of paddle pop sticks (popsicle sticks), paint, and glitter. A very simple star made out of 6 popsicle sticks. Potato Stars- Paint, glitter, and a potato can help make a beautiful night sky. Even though this comes from a preschool craft book, it is appropriate for older children to do. (Preschool Christian Crafts by Linda Standke, page 53). Shine On- Students make punched-tin candleholders. (Bible Story Crafts & Projects Children Love by Kathy Ross, page 71). Cute, easy craft made out of a baby food jar and tissue paper. Tip: Make a mixture of half water and half glue in a paper cup. Paint with a paintbrush or a Q-tip a small area on each jar with the glue mixture, then cover the area with small pieces of tissue paper. Use a variety of colored paper to cover the entire jar with two or three layers of tissue paper. Coat the finished jar with thinned glue to seal. Glitter and Sugar Ornament- A fun and easy way to make lots of pretty ornaments to decorate your Christmas Tree. A sample craft from Kathy Ross' book: The Best Holiday Crafts Ever!, page 144 & 145. Play Memory with these nativity cards. Go Fish game using pictures from the nativity including the baby Jesus, Mary, Joseph, the angel, shepherds, wise-men, and more. The object of the game is to get the most sets of four to win. More directions are at website. Open and print the pdf files either the two part color files or the b/w file. 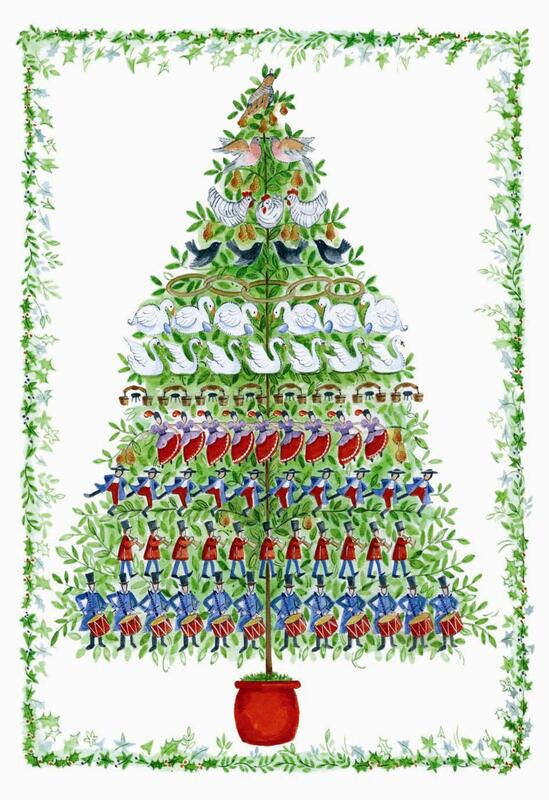 There are 8 different sets (four cards each) for a total of 32 nativity cards. If you have a large family/group print two sets and combine. A fun way to review the story of the birth of Jesus. Gifts For Baby Jesus File Folder Game: The object of this game is to be the first to collect gold, frankincense, and myrrh. Introduce snack: Where was baby Jesus laid into? Introduce snack: How did the Wise Men find Jesus? They followed a very bright star. Peanut Butter and Jelly Stars- Get a large star shaped cookie cutter and make star shaped peanut butter and jelly sandwiches. Spread peanut butter on star shaped crackers. Print these out for the children to color or print them in color. Trace the star and write what shape it is. worksheetunivers.com- Color the stars according to the directions given. Shepherd’s Visit (maze)- Bible Story Puzzles by Linda Standke page 21. Jesus’ Birth (connect the pictures that go together)- Bible Story Puzzles by Linda Standke page 20. A Bed of Straw (dot-to-dot)- Dot-To-Dot Bible Pictures by Linda Standke, page 16. A Star Led Them (dot-to-dot)- Dot-To-Dot Bible Pictures by Linda Standke, page 17. Magi Visit (dot-to-dot)- Bible Story Puzzles by Linda Standke, page 22. Escape to Egypt (cut the pictures and glue together on another sheet of paper)- Bible Story Puzzles by Linda Standke, page 23. Shepherds Find the Savior (find the hidden pictures)- Hidden Pictures Explore Hidden Treasures in God’s Word PK-K by Linda Standke, page 18. The Magi Seek Jesus (find the hidden pictures)- Hidden Pictures Explore Hidden Treasures in God’s Word PK-K by Linda Standke, page 19. An Angel Tells Good News- Connect the dots in the picture to see who brought Mary good news. (Big Puzzles for Little Hands: Jesus’ Life and Lessons by Carla Williams, page 9). Joseph Cares for Mary- In the space draw a picture of what the angel told Joseph in his dream. (Big Puzzles for Little Hands: Jesus’ Life and Lessons by Carla Williams, page 10). A Trip to Bethlehem- Look at the two pictures. The second picture has 6 missing parts. Circle the missing parts. (Big Puzzles for Little Hands: Jesus’ Life and Lessons by Carla Williams, page 12). Angels Tell Shepherds the Good News- Match the angels. (Big Puzzles for Little Hands: Jesus’ Life and Lessons by Carla Williams, page 13). Wise Men Visit Jesus- Find the matching pictures and draw lines to them. (Big Puzzles for Little Hands: Jesus’ Life and Lessons by Carla Williams, page 14). Go to Egypt- Help Joseph take Mary and Jesus to Egypt (maze). (Big Puzzles for Little Hands: Jesus’ Life and Lessons by Carla Williams, page 15). Activities to help your children remember the books of the Bible. Be sure to adjust the activities to fit your faith teachings. 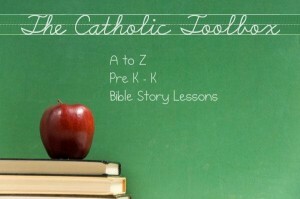 catholicicing.com- Catholic Books Of The Bible Resources For Kids- Song, Free Printables, and More! This FREE set includes instructions, call cards, and 12 Bingo cards to practice the books of the Old & New Testament (Protestant). These cards are about Old Testament Books. They were made using such words as 1 Chronicles, 2 Samuel, Esther, Habakkuk, and Job. These cards are about New Testament Books. They were made using such words as 1 Corinthians, 2 Corinthians, 3 John, Hebrews, and Mark. In this noisy and rambunctious game, children will learn the books of the Bible and where to find them. *You can change this easily to Catholic books of the Bible. In this fun and lively action game, kids will learn the books of the Bible and have fun doing it! This activity will inspire children to investigate God's Word on a weekly basis for many months. *You can change this easily to Catholic books of the Bible. Players must unscramble the books of the Bible and put them back in order. A good memory game! 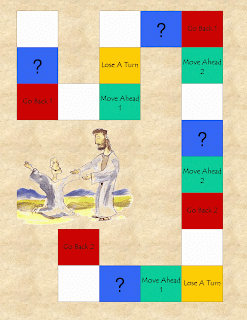 Books of the Bible Game- For this game, the players have to recite the books of the Bible, from the beginning to where they are on the board every time they move. The Great Book Challenge- A Bible challenge game for the students that the prize could be changed to be anything the teacher wishes. Books of the Bible Relay- Students will enjoy learning the books of the Bible by racing against other players to put them in the correct order. (The Super Bible Game Book by Linda Standke, page 85 - 94). 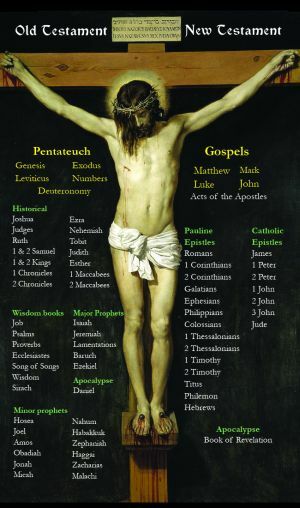 kidssundayschool.com- Books of the Bible Starboard: Recreate the design below on a large piece of poster board, and display in your classroom. The kids get excited when they are able to stick on another star. *You can change this easily to Catholic books of the Bible. Catholic books of the Bible bingo game that you can buy. Collect milk caps with the books of the Bible on them. Put them in order or categorize them by the milk cap colors. Can you find 16 Books of the Bible in this paragraph? Several different puzzles to choose from to print. *You can change this easily to Catholic books of the Bible. Advent- word wall, Bible story with questions, songs and/or finger plays, activities, crafts, games, coloring, handwriting, mini books, puzzles, etc. Advent- vocabulary words, Bible story with questions, activities, crafts, games, mini books, puzzles, mazes, worksheets, etc. Here are the directions from various resources on how to do the lapbook. These can give you lots of great ideas to make your own. *Be sure to adjust them to fit your faith teachings. christianpreschoolprintables.com- Christmas Word Wall Cards (scroll down to this). Do you know this word? Advent is the special time before Christmas. It is the season of the Church year during which we prepare to celebrate Jesus’ coming as our savior. Christmas is the day that Jesus was born and it is the day we celebrate His birth. Advent is the four weeks (hold up 4 fingers) before Christmas. Each Sunday during Advent we light a candle and we say a prayer. Introduce songs and/or finger plays: What is the special time before Christmas called? Introduce activities: What is the special time before Christmas called? Discuss on the board (show students what color each candle is) and review how an Advent Wreath is lit and in what order. Students make Advent Wreath. "No Burn, Construction Paper Wreath - Made with your Child's Handprints"
Introduce craft: Advent as a time before Christmas. How can we count down the days until Christmas? Advent Calendar- A take home Advent calendar that you make. (Big Book of Ideas for Children’s Faith Formation, by McNamara, McKeever, and Robinson, page 7 & 8). Printable Advent Chain- Print out pattern on colored paper. Have students cut into strips. Build your paper chain stapling the strips with a stapler in the correct order. Each day you tear off a piece of the chain that corresponds to the date and do the activity. Before you know it, it will be Christmas day! Print out pattern on colored paper. Have students cut into strips. Build your paper chain stapling the strips with a stapler in the correct order. Each day you tear off a piece of the chain that corresponds to the date and do the activity. Before you know it, it will be Christmas day. Introduce game: Mary had some good news to tell. What was her good news? Introduce game: What do you know about Advent? Let’s find out. Advent Adventure- Take the children on an Advent adventure. (Big Book of Ideas for Children’s Faith Formation, by McNamara, McKeever, and Robinson, page 6). Advent Wreath (file folder game)- The object of the game is to color all of the Advent wreath correctly. To Play: Place 2 small baskets or boxes on the table to put cards in. Put the cards in one basket (the other basket will be for discards). Give each player a copy of the “Advent Wreath Coloring Sheet”. Place your markers on START. Roll the die and move that many spaces. Follow the directions on the space you land on. If the player lands on a “?”, they draw a card and they can color one of their candles on their Advent Wreath Coloring Sheet the correct color. If they do not need that color on their wreath, they do nothing. If a player lands on a space with the leaves, they may color some of the greenery on their wreath. When a player has completely colored their Advent Wreath Coloring Sheet correctly, he/she is the winner. Play continues until all players have colored their sheets. The activity below is free; however it can only to be used for classroom and personal use. It may not be published on any websites or other electronic media, or distributed in newsletters, bulletins, or any other form or sold for profit. Reproduction or retransmission of this, in whole or in part, in any manner, is not permitted. *All graphics/images/clipart etc. used on this activity are not my own and are from various internet sources. Advent- Mini book for the children to color. My files are huge so to keep them free I post all my printables at The Catholic Toolbox Printables Yahoo Group- activities, worksheets, booklets, puzzles, handwriting, Take Home Sheets, story wheels, etc. An Angel With Good News (mini book)- New Testament Take-Home Bible Stories: Easy-to-Make, Reproducible Mini-Books That Children Can Make & Keep!, Preschool - Grade 2 by Thomas C. Ewald, page 7. An Angel Tells Good News (dot to dot)- Big Puzzles for Little Hands: Jesus’ Life and Lessons by Carla Williams, page 9. Mary’s Good Answer (find the hidden picture)- Hidden Pictures Explore Hidden Treasures in God’s World PK-K by Linda Standke, page 17. You know those looks; the outraged and discussed looks that parents receive when their child misbehaves in church. Yes, we’ve all seen it and unfortunately at times our children can misbehave as well at Mass. Children can run down the aisles, crawl under the pews, make so much noise that no one can hear what is going on, scream and cry as if they are being tortured, and even throw Cheerios at each other and some unfortunate parishioners nearby. The congregation consequently thinks that the child is extremely disruptive and with all their terrible behavior that they must be possessed. Meanwhile, the parents try to console their child and get them to stop, but to no avail. They therefore have to make a mad dash to the Cry Room with their child before some parishioner has a major conniption fit and lashes out at the priest after Mass. Children at Mass is an extremely touchy subject among parishioners today. Some say if the child can behave appropriately and stay quiet, by all means let them come to Mass. But . . . (yes that dreaded word that parents loathe to hear) if they cannot control themselves in a respectful way and allow everyone to hear the Mass, please take your child to the Cry Room. Period. Jesus said, “Let the children come to me” and children need to be in Mass so they can learn about our faith and be part of the congregation so how can this be done without causing problems? 1. Prepare your child in advance. Teach your child about how they are to behave in church and why. Say to your child: “How should you behave at church? What should you not do in church? Can you run in church? Why should we not run in church?” (It does not show respect to God and it is not good manners.) “God doesn't come to your house and run around. You shouldn't run around in his.” Discuss. “If you ran in church, what would other people do? Discuss other bad behaviors and manners that kids do in church. 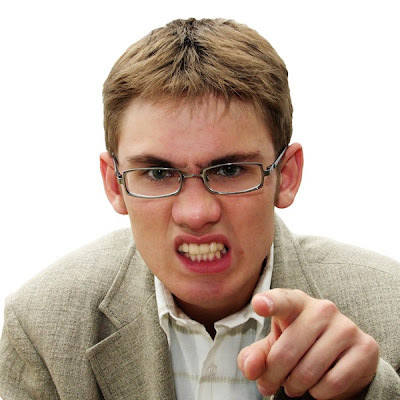 How would someone in church react if they saw you do something bad? Discuss. How would your parents feel? Discuss. Why are good manners important at church?” (Because you should respect God's house.) Etc. Discuss. Social Stories for Church- Social stories are an effective method of providing both guidance and direction to promote self-awareness, self calming, and self-management in responding to social situations. The technique involves creating a short story that describes the situation and includes appropriate actions and expressions. By creating a short story, the situation is described in terms of relevant social cues, anticipated actions and information on what is occurring and why. The stories are written according to specific guidelines based on Gray’s extensive use of this technique. The story is also customized for the individual and their circumstance. 3. Bring quiet activities for your child to do during Mass (books, coloring, etc.) if needed. Give praise to your child for good behavior. 4. Sit in the back so you can easily get to the Cry Room if your child (or the parent) needs a break. 5. Expect good days and bad days. No one is perfect and remember to take one day at a time. Thank you God for Word Wall- Word wall templates are large flash card printables that you can hang on the wall to aid children when they are learning or using new vocabulary words. Have “Thank you God for” already on the board and ask the children to answer this by using the cards that are provided below. Introduction to story: Have you ever done something kind and no one said thank you? How did it make you feel? How do you feel when someone says “Thank you” to you when you have done something? It makes everyone feel good when someone says “Thank you”. Or while reading the story do cut outs from “The Ten Lepers” (Snip-And-Tell Bible Stories by Karyn Henley, page 88 & 89) as the story unfolds. Then ask questions from below. How do you think Jesus felt when one man said thank you? How do you think Jesus felt when the other men did not say thank you? Introduce songs and/or finger plays: How do you feel when you say “Thank you” to God? christiancrafters.com- Thank You God For . . .
Several lessons and activities listed. street.ns.ca- Thanksgiving lesson with puppet show, object lessons, games, etc. daniellesplace.com- Don’t Forget To Say Thank You (The Story of the Ten Lepers) lesson with crafts, games, activities, etc. dltk-bible.com- Jesus Heals the Man with Leprosy lesson with lesson with memory verse, teacher's guide, puzzles, take home sheet, coloring pages, crafts, etc. Introduce craft: What should you say when someone says “Thank you” to you? God has given us so many things to be thankful for. What are you thankful for? Have children make pictures of things they are thankful for. Children can cut out pictures from magazines to make a collage of things they are thankful for. Pumpkin Pie Spinner- This pumpkin pie may look good enough to eat, but it's actually an interactive spinner that reveals things your child is thankful for. Children can draw what they are thankful for instead of writing. The Ten Lepers (Bible Story Wheel)- Bible Wheels to Make and Enjoy by Carmen Sorvillo, page 49 & 50. Grace Before Meals 3-D Picture- Students make a placemat any way they like using a large piece of construction paper 18 X 12 and other craft supplies. Then glue a napkin, silverware, plate, and a plastic cup on it like a place setting. Students then glue the Grace Before Meals prayer on the plate. 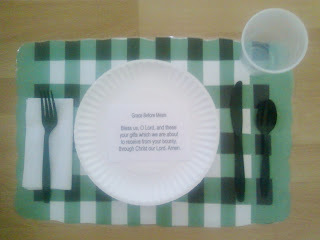 The traditional Grace Before Meals prayer printed out to glue on to the center of a paper plate. *After my students make their placemats I asked them, “How do we set a table?” We then do it slowly step-by-step making the craft (I have the students glue the prayer on the plate later) so hopefully they can help out at home setting the table. I then say to my students: Do any of you say “grace” or thank God before you eat your meals? Do any of you have a “standard” grace you say at home? (Give a few examples.) Why do we say grace? Is it important? Why? Sometimes we can easily forget to thank the Lord for all He has given to us and a great way to remember is to always pray to Him to thank Him for the food He gives us to eat each day. We have lots to be thankful for. Let’s not forget to say thank you to God. Introduce game: How do you think God feels when you say “Thank you” to Him? Scroll about ¾ down to this game under Activity. Race to Draw Power and Thanks- A fun low energy level game with complete directions, supply list, what to say, and post game discussion questions. Through a drawing race, kids will discover Jesus' power to heal ten lepers and will think of things for which they can thank Jesus. (The Encyclopedia of Bible Games for Children's Ministry by Group Publishing, pages 122 & 123). 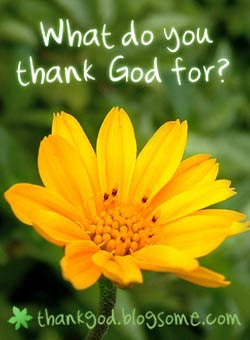 Who Gave Thanks To God (card game)- Are you thankful to God? 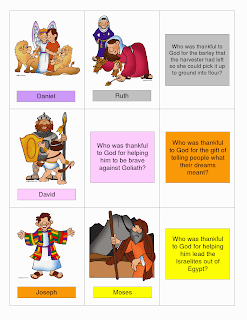 Here is a fun game about Biblical characters that are thankful to God. The object of the game is to match more pairs of cards than the opposing player(s). On each turn, the player will turn over two cards (one at a time) and will read them out loud (or someone else can read the cards for them). The player keeps them if they match (the question card is answered correctly by matching it with the proper picture card). The cards are color coded to avoid confusion of which pair of cards match (each matching pair shares the same text box color). If the player successfully match a pair of cards, that player also gets to take another turn. When a player turns over two cards that do not go together, those cards are turned face down again where they were found and it becomes the next player’s turn. 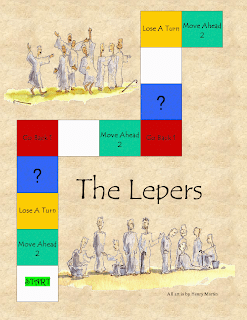 The Lepers (file folder game)- The objective is to return to Jesus first to thank him. Introduce snack: We need to be thankful to God for giving us our basic needs. As in the prayer we just learned, we are thankful for the gifts we are about to receive. Thanksgiving is the time we give thanks and blessings for the things we are thankful for. I just got back from Walmart and Chutes and Ladders was on sale for $5. This would be great game for teaching about rewards and consequences for your actions. As kids travel along the game path, they encounter situations that reward them for good deeds by letting them climb the ladders or punish them for misbehaving by sending them down chutes. 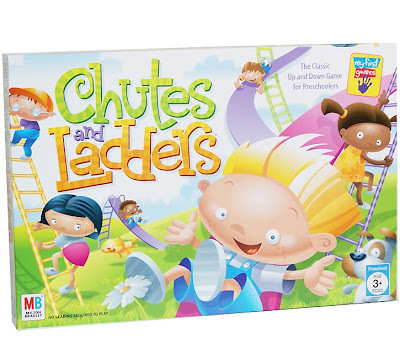 • Chutes and Ladders is ideal for younger children who are still learning to take turns and just beginning to recognize numbers (the spinner stays in the single digits). Read story: "Joseph and His Wonderful Coat" and ask questions from Take Home Sheet that will be sent home today. Introduce activities: Who was given a beautiful coat from his father? sermons4kids.com- Joseph and His Brothers (group activities) crafts, games, snacks, etc. dltk-bible.com- The Story of Joseph lesson plan with coloring page, crafts, games, mini book, snacks, take home sheet, puzzles, etc. calvarycurriculum.com- 6 lessons with memory verses, circle the correct words, true or false, fill in the blanks, puzzles, and color sheets. Introduce craft: What did Jacob give Joseph? A wonderful coat. A cute magnet of Joseph and his coat of many colors. (Crafts from your favorite Bible Stories by Kathy Ross, page 18 & 19). This activity is a story wheel, where you or the students can re-tell the story of Joseph’s life by turning the wheel revealing Joseph’s dreams one at a time through the viewing window. Introduce game: What does God want us to do when someone does something wrong to us? Forgive them. You’re Forgiven Tag- This game will help your kids discover the need for forgiveness in their lives. (The Encyclopedia of Bible Games for Children’s Ministry by Group Publishing, page 29). Forgiveness Balloons (page 62)- We can celebrate the fact that God will always forgive us when we ask Him. His forgiveness helps us want to forgive others. Joseph forgave his brothers, even when they had treated him very badly. In Bible times God asked His people to think about their wrong actions during the 10 days now called the Days of Awe. We’ll play a game by trying to tap a balloon 10 times in a row. Joseph & His Brothers (file folder game)- Answer questions about Joseph & His Brothers and receive a bag of grain. The first person to collect 7 bags of grain (representing the 7 years of plenty), wins. Introduce snack: What did Jacob give Joseph? A wonderful coat. What did it look like? It was very colorful. Have the children make coat shaped cookies and decorate them. (Example: one large rectangle for main part of coat, and 2 long thin rectangles for the sleeves of the coat). A Special Coat- Joseph had a special coat. Find the coat that does not have a twin. newadvent.org- History of this devotion. Also considers the Orthodox and Eastern-Rite Catholic practice. Print them out and laminate them (or use plastic sheet covers). Then the kids can use them to follow along as they pray. They can use a dry erase marker to fill in the rosary beads on the sheet as they pray each prayer. Rosary Lapbooks- A Rosary Lap Book is a creative way for children to record information they are learning and create attractive presentations of that information, as well as use the information to study. These are just right to keep little ones happy, involved, and interested while doing the rosary. *Make a Holy Rosary bulletin board with the class. Google Rosary Bulletin Boards for ideas. Help children learn to pray one decade of the Rosary with this convenient guide. 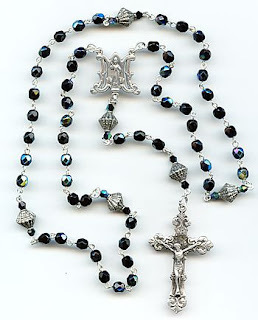 The illustrated guide provides a large image of a Rosary and clearly identifies which prayers to recite for each bead. Additional pages provide the words for each prayer of the Rosary, as well as a listing of the twenty Mysteries of the Rosary (Joyful, Luminous, Sorrowful, and Glorious). For your convenience, the materials to create smaller reference cards are also included. For added durability, print or mount these pages on cardstock and laminate. Punch a hole in the cards and fasten with a binder ring to keep all of your cards together. 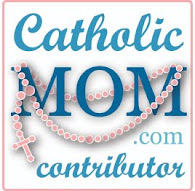 how-to-pray-the-rosary-everyday.com- How To Pray The Rosary Printable Guide (scroll down to this). Be sure to click on learn how to fold it so you can make it into a booklet. fcpeace.com- Coloring pages for all the mysteries. A fun game to have the students learn prayers from the rosary. Print out two copies and color. Cut out and play Memory. The Bookworm- Printable cards for each Mystery. Children can learn to match the items to the cards and use them to learn the order of the Mysteries. To make Montessori-style three part cards, print out two sets of cards, and cut the second set into separate pictures and captions. Worksheet for children to colour the rosary beads to correspond with the appropriate prayer. Join for FREE and download worksheet. This worksheet below is free, however it can only to be used for classroom and personal use. It may not be published on any websites or other electronic media, or distributed in newsletters, bulletins, or any other form or sold for profit. The Rosary, Part I- In the left column, are the names of the fifteen mysteries. The right column contains brief descriptions of each mystery. Write the letter of the description next to the name of the correct mystery. 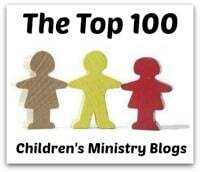 (100 Activities Based on the Catechism of the Catholic Church by Ellen Rossini, page 77). The Rosary, Part II- Connect the letters from the previous activity in their final order to solve the dot-to-dot puzzle. 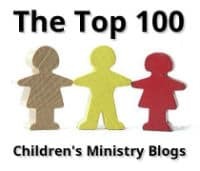 (100 Activities Based on the Catechism of the Catholic Church by Ellen Rossini, page 78). Joshua & Jericho Word Wall- Word wall templates are large flash card printables that you can hang on the wall to aid children when they are learning or using new vocabulary words. Read story: “The Walls That Fell” from the book Snip-And-Tell Bible Stories by Karyn Henley, page 28 & 29, and do cut outs while the story unfolds. 4. What did God tell Joshua to do for six days? (Have everyone march once around the city. Behind them seven priests would blow ram’s horns as they walked in front of the ark. 6. What did God tell Joshua to do for six days? March once around the city with soldiers. Behind them seven priests would carry rams horns ahead of the ark. 7. What did they do the seventh day? (They marched around the city seven times and had the priests blow their horns. When the priests gave a long blast on the ram’s horns it was a signal for everyone to shout. Follow the directions provided or you can decorate a large piece of brown craft paper with stamped or painted designs (the kids can color using markers, crayons etc too). Apply glue to the back of the brown paper after decorating, and then wrap it while still wet round the party horn. Trim excess, bend the open end up a little as shown in photo above. Let dry. You need: New Year's/birthday Party Horn (dollar store), brown craft paper, white glue, rubber stamps and ink pads or paint and brushes, glitter, and scissors. Ram Horn Trumpet- Easy and fun horn craft to blow the mighty walls of Jericho down. (Crafts from your favorite Bible Stories by Kathy Ross, page 24 & 25). Help the children make horns. Let them each decorate a paper towel tube with markers and crayons. Place a square of wax paper on one end of the tube and secure it with a rubber band. Use a pencil to poke a hole in the wax paper. Show children how to blow the horns like kazoos. Print out black and white pages of The Walls of Jericho (page 1 & 2) for the children to color and make into a 3D model. Have the children make a wall out of cardboard boxes and reenact the story of Joshua and Jericho using their horns and knocking the wall down. Walls of Jericho (file folder game)- The first player to go around Jericho 7 times and receive 7 tokens wins. Introduce snack: What surrounded Jericho? A huge enormous stone wall. Walls of Jericho- An edible craft that the children can make and eat. Jericho Wall- Break graham crackers into fourths and use peanut butter to make the walls of Jericho (like a sandwich). The Battle of Jericho (maze)- Obedience Bible Story Puzzles: PK - K by Enelle Eder, page 29. Wall of Jericho (maze)- Bible Story Puzzles: PK - K by Linda Standke, page 11. Joshua and Jericho (find the hidden picture)- Hidden Pictures Explore Hidden Treasures in God's Word: PK - K by Linda Standke, page 10. The Trumpet Blast! (dot-to-dot)- Dot-to-Dot Bible Pictures: PK – K by Linda Standke, page 10.